Yinghua's family is located at Huangluo Village, Yu Town, Henan Province. At birth, her left knee grew reversely, and her left leg can only bend forward. Her left front foot branched into two parts, each with four toes. Her leg becomes numb easily, causing her to fall very often. Because of long-standing uneven exertion on her back, a tumor grew there. The tumor became bigger and bigger, so she can't straighten her back any more. Because of financial hardship, she wasn't diagnosed until when she was 5 years old. Her doctor said, “Yinghua's left foot can be treated, but it has to go through two major surgeries, which will cost several hundred thousand Yuan. The surgeries come with some risks.” Her mother was frustrated with the poverty of the family and abandoned them when Yinghua was 4 years old. She left a note, “Please take care of my daughter. Goodbye.” Ying hua has not heard from her ever since. Shortly after, Yinghua came to the age of school. 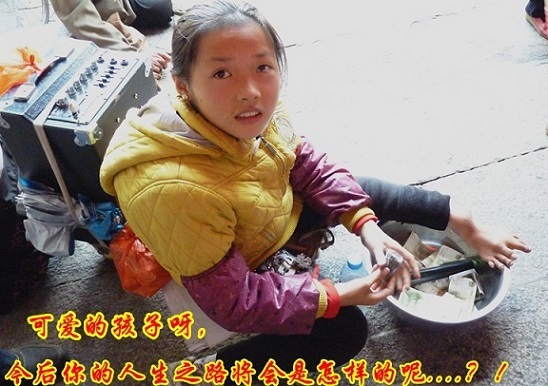 Her school was too far from home, so her grandmother carried her to school everyday. 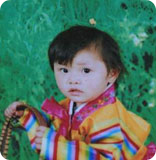 When her grandmother was tired, Yinghua would walk for a distance on her own. Unfortunately, her grandmother passed away when she was 7. She had to drop out of school. At this point, the family has only Yinghua and her father left. 4 years ago, her father was diagnosed with diabetes. As his disease progressed, he lost more and more weight. He also developed hearing problems. Sometimes he fainted while walking. Due to his medical condition, he lost his job and had to farm for a living. His medicine costs at least 8 Yuan a day. His savings were dwindling. 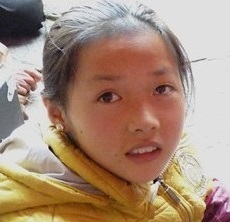 The experts in Beijing have drafted a new treatment plan for little Yinghua: She will need a three-stage surgery: 1) to repair her scoliosis to help her sit up, with a budget estimate of 120,000 to 130,000 RBM; 2) to remove the extra tissue from her feet to help her stand up after neurological recovery, with a budget estimate of 5,000 to 10,000 RBM; 3) to straighten her legs to help her walk independently once she is neurologically recovered, with a budget estimate of 30,000 to 40,000. The total estimate was 180,000 RMB. This number seemed so astronomical and impossible for this family, who lived off the money from Yinghua's street performances. Please reach out to them and help this teenage girl grow up to her full potential! Thanks for everyone's love and help from the 9958 Pediatric Urgent Center, Ying Hua has been admitted to the Beijing 306 Military Hospital. The orthopedic surgeon Dr. Wu has made an initial diagnosis. Her disease is relatively complicated and needs multiple images and expert discussions to finalize her treatment plan and estimated medical cost. Yinghua has been to Beijing for more than one week now. She has been through many exams and tests. She is currently doing physical therapy in preparation for surgery, awaiting the first stage scoliosis repair. Because of her existing leg length discrepancy, the hospital has invited outside experts to be involved in her final surgical and medical management plan, in order to optimize her chances to walk normally. After another expert meeting, Yinghua's surgical plan has been determined: 1) Left knee repair and lengthening of the left femur using an orthopedic rod. 2) Scoliosis repair after the femur has been lengthened about 10 cm. The time interval between these two surgeries will be approximately 1 year.